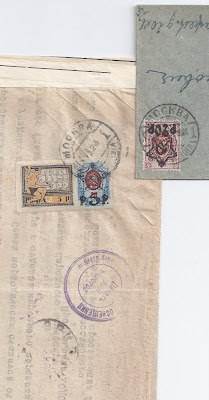 I began writing about faked material from Armenia back in the 1990s, after someone sold me a batch of 1922-23 stampless official letters to which genuine stamps had recently been added - and forged cancellations then applied. Nice stampless covers were thus converted into pretty worthless fakes. Today I was looking through a collection of over 100 RSFSR 1923 "Star" overprint covers and I was reminded of old times. Here is a single sheet of official correspondence sent from Moscow to Yerevan. On the inside the mimeographed text is dated 2 III 23. On the outside the item is numbered ( you can't see this - I have folded the item)and a PECHAT PAKETOV seal has been applied in violet ink (this you can see). The weak ERIVAN receiver cancellation is genuine. The franking is possible but not plausible: combinations of 1922 5th Anniversary stamps and Star overprints can be found but they are unusual (there were just two more in the accumulation I was looking through). The 5 p Star overprint is quite scarce used but very common mint. The 5p Fifth Anniversary is also very common mint. It was the unusual franking which made me look closer. Look at the MOSCOW despatch cancellation. I don't recall seeing it in this kind of blue-grey before but all things are possible I suppose. However, I went through my accumulation looking for another example of this cancellation. I found two examples and show one applied to a December 1922 philatelic local cover, correctly franked with a 20p / 70 kop stamp. The other one I have is identical in ink and lettering. The two cancellations are quite different. Much as I would like to have a Moscow to Yerevan item like this, I conclude that the stamps have been added to this document maybe ten or twenty years ago and a fake Moscow cancellation applied. The cancellation is in the wrong ink and the design is only a careless copy.